The Fitbit band is getting popular among kids and adults in a way that both are learning to take care of themselves only through the use of such a fitness app. And it is essential for a user to know the Fitbit app cost. Today nothing comes free of cost and though it’s mentioned free, there are certain conditions attached to it. 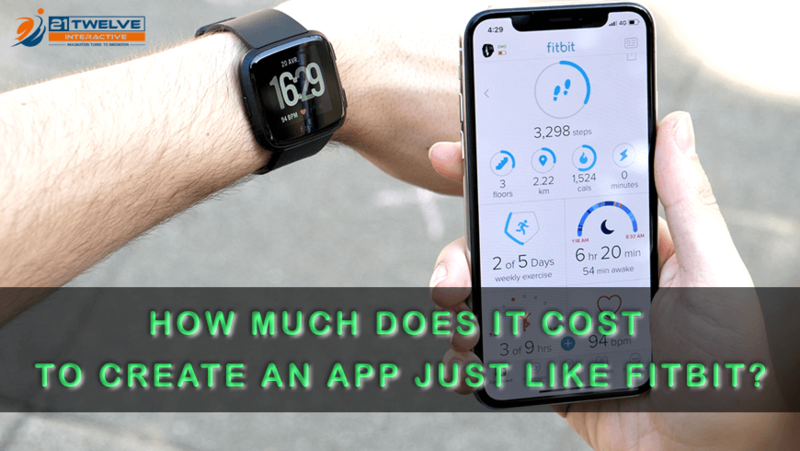 The next question which gets stuck in the mind is, ‘How much is the Fitbit app?’ Before deriving the final cost involved in the development of this fitness app, let us look into some of the features and factors which get involved in creating such an application for fitness and the body. The famous alarm system and schedule settings according to your daily routine. Just like any another virtual game, here also one can record their achievement on completing a certain level of fitness. Fitness statistics are displayed with a combination of calendar and graphs. There are virtual as well as real rewards on completion of certain levels as well as recognition for the same. Monitoring the heart rate and measuring the calories burnt with the help of artificial intelligence and a mobile application. A virtual account or profile is created which records all the data related to exercising in the gym, cycling, or any other workout. Social Media enabled, such that the rewards and results by using this particular application can be shared with friends and liked at the same time. The time frame of several weeks should be considered according to the robustness and complexity of the fitness application which is built. As future growth, the latest trends for IT industries creating profession apps related to daily purpose increased. 21Twelve Interactive is building a unique application like Fitbit walking apps at cheapest cost as per the US dollar from $3000 to $11000. The operating system platforms it should perform on namely IOS and Android. Functioning of this application on the respective operating systems. The compatible device of this particular application among laptop, tablet, phone or even desktop is decided. This also leads to the fact that there exists a Fitbit iPad App. Fitness based applications ensure its particular user to be in good health through the availability of various products and physical fitness of a particular user shall not get hampered or get affected in any way possible. There is one more factor which is responsible for the cost of developing a particular fitness application. This is also known as the location or demographical factors. Research reads that software development companies based in Europe, the US, or Canada charge or quotes a higher price as compared to the countries like India or China, which are based in the Asian subcontinent. Moderate fitness applications: An approximate of $3000 US dollars to an approximate of $7000 US dollars. Complex fitness applications: An approximate of $7000 US dollars to an approximate of $11000 US dollars. Highly complex applications: An approximate of $11000 US dollars and above. These are the various costs involved in developing mobile app development services for health or fitness applications. And like lunches in the corporate, it does not come for free. There are certain costs involved like the features the fitness app or gadget is going to provide for its user. The more complex and robust a particular application, the higher is the price associated. The next question which comes to the mind is, ‘How much money is the Fitbit?’ Unlike any other fitness or health-related applications, Fitbit is the only brand in fitness and health genre which provides a variety of an approximate of ten applications for its users according to their dynamic needs. The price of this basic device amounts to an approximate of sixty US dollars which help athletes maintain their walking, calories, exercise, time and active minutes. This is a small device which can be clipped on to the user while working out. This device has a small display which can be easily read, has a variety of colors for the device to be sold, and can synchronize with compatible devices without any wire. The battery life of this particular device also lasts from an approximate of four to six months. All these features make it a basic, reasonable, and a robust activity tracker for athletes and sports personnel. This device costs up to an approximate of hundred US dollars. This device has some additional features than the earlier version. This device can measure the number of floors that have been climbed; monitors sleep hours, burnt calories, distance covered, and step counts while walking. This particular device comes with an additional feature for setting alarms along with the clock settings. However, the battery life for this particular device is from ten to fourteen days approximately and can be charged using a USB cable once the battery is depleted. This device can also be clipped on as it does not come with the band. Just like the name indicates, this device is flexible and comes with a band which enables it to be worn on the wrist such that it can track the steps, monitor the sleep, calories shed or gained, and a vibrating alarm. However, this particular device does not have a display screen and has LED display lights which monitor the progress in each health task involved. The cost of Fitbit in this variant is approximately a hundred US dollars. The battery life lasts up to five days and can be charged. This is the newer version of the earlier device. This device also comes with a band which monitors sleep, calories, and steps and is water or swim proof. This is the slimmest version of the Fitbit and provides its users with text notifications for each activity and LED display. One can either flaunt it as a band or a pendant at the price of just a hundred US dollars approximately. The battery life of this particular device also lasts for a period of five days only. This is a newer version to its existing brothers. It is a broader version and apart from steps and calories, this particular device has an OLED display which shows the time through the clock feature, auto sleep mode, sleep monitoring with an alarm feature, and also a caller id. The battery life can last from about seven to ten days. And all these features come at a price of a hundred and thirty dollars respectively. This is suitable for all athletes. This is also a free Fitbit app for iPhone. This is a slim and sleek version of Fitbit bands. This stylish fitness tracker comes in various colors including black, blue, plum, and, teal. This device enables an OLED tap display which tracks all the activities during the day including walking or sleep. As it is synchronized with other compatible devices, it performs seamlessly. All these features come for a price of a hundred and thirty US dollars approximately. The battery of this band can last up to five days. This band also comes with an OLED display with an additional feature of monitoring the heart rate apart from tracking exercise and sleep. This band also features the caller id and is water resistant. The batter of this design can last for five days. The cost of this particular band comes to around a hundred and fifty US dollars approximately. This is a broad fitness wrist-band which comes with additional accessories which can be interchanged as per choice and mood. The OLED screen helps in tracking the heart rate, calendar, text, or even calls through the alerts received through the band. The unique selling proposition of this model of the Fitbit is that it provides breathing guidance to its particular users. All of these unique features for just a hundred and fifty US dollars approximately. And the battery life also lasts for five days at the most. This band comes with some additional features in such a way that, it is not just an ordinary fitness band but a full-fledged smart-watch which helps a user to enjoy music by controlling it through the watch itself. Also other factors like monitoring the pulse of the heart, managing calendar, as well as emails along with GPS router to navigate on the roads apart from steps, sleep, and exercises. This smartwatch comes at a price of two hundred US dollars approximately. The battery life of this smartwatch can last up to five days. This can also be termed as Fitbit iPad app as it is compatible with smart-phones, tablets as well as laptops. This smart-watch is the last but not least in the fitness band category. The unique selling proposition of this watch is that this watch enables fitness metrics through artificial intelligence for its users which can log records of their workouts and exercises along with monitoring the heart or the pulse rate and listening to music all at the same time. The battery life of this smart-watch can last from seven to ten days approximately. And this masterpiece also defines, ‘What is Fitbit mobile track?’ All this is for two hundred and fifty US dollars approximately and approximately a hundred dollars reasonable than its IOS versions. The next question is, ‘Does the Fitbit app cost money?’ the answer to this is yes for the service providers and no for the users. The Fitbit app comes free of cost to the Fitbit fitness band users across Android and IOS. But associates costs according to the version of gadgets and applications developed for its users. The better the feature, the higher is the cost associated with it for maintaining the quality and robustness.